If i should mention an extra historic SAK then it must be the Giant knife. 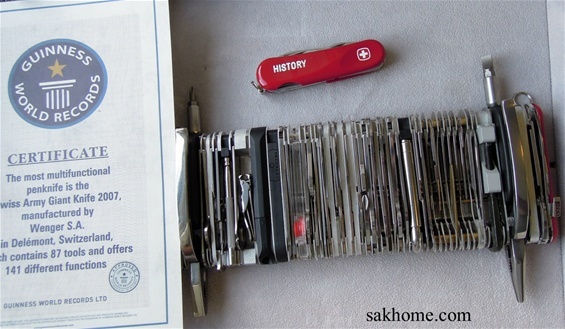 It is in the Guinness book of records as the “most multifunctional penknife” The Swiss Army Giant knife 2007! On the picture is my 2009 model and it is a very special knife for me as a collector and enthusiast. For me this is the Ultimate Wenger Giant Knife. The functions in the company’s inventory at a special time are represented and I can very much understand that this knife is a record breaker because all the functions or implements are the same ones that you will find on all the different Wenger knives. There are some modifications done for the assembly. Every Wenger function is developed to be used and they got individual evolution. The functionality is of course not there on such a large SAK. It is easy to understand why it holds a title. The Giant knife is a big success and it`s been discussed and showed in different events and magazines. Today it is an icon and everyone recognizes it momentarily. Can you imagine how difficult it is to make something like this? Even for a super modern production in a factory it is almost not possible to do.